Something’s up with Glossybox. A slew of subscribers didn’t get their August boxes until practically the middle of September. Isn’t that strange? I’m all for waiting until the end of the month to do your shipping – I mean, if you get the box every 30 days, then technically it’s on time – but to wait until the next month to ship the previous month’s box? No likey. Well, dangit, it’s a pretty good box. I was all ready to start pouting and complaining. You know how when you’re in a bad mood and someone tries to get you out of the bad mood and you’re not welcoming of that idea one bit cuz you’re not done being in a bad mood? This is like one of those times. I will tell YOU when I’m ready to be happy again. Thanks. I’m generally okay with getting a shampoo and conditioner. I have been using samples without having to purchase anything on my own for about a year now. 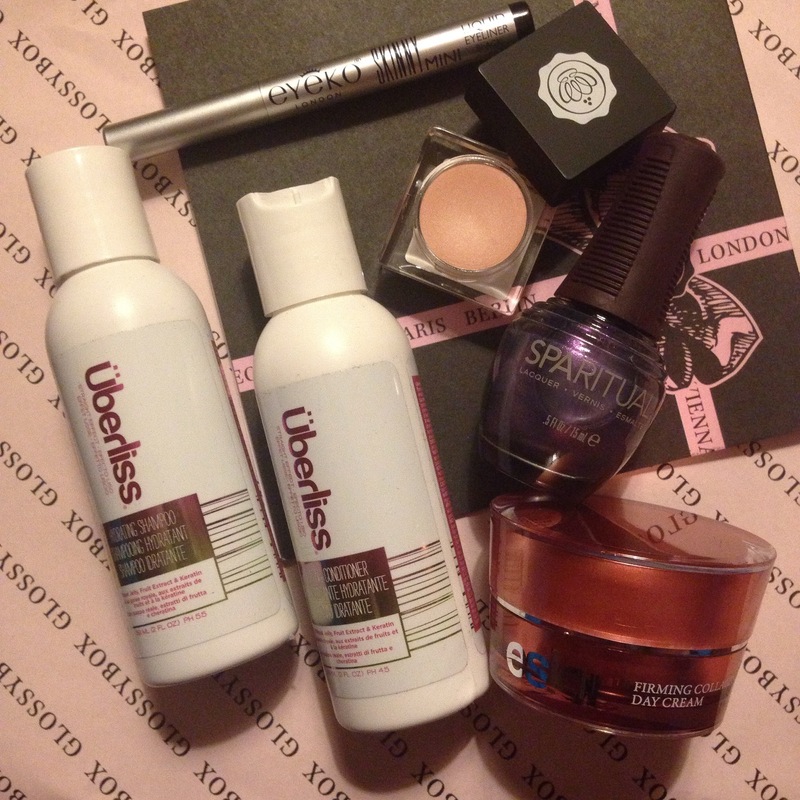 I was close to running out and was waiting for Glossybox to arrive so I could start using this Uberliss duo. But then I was waiting and waiting and waiting for eons. Broke down and had to buy some full-size L’Oreal stuff. Well what a big o poo, ya know? So I have no idea when I’ll get around to using this stuff, as I have also traded in some birthday money for some other shampoo and conditioner that I’ve been wanting to try for awhile (more on that later). In the meantime, just know this is a hydrating sulfate-free shampoo that is supposed to be super foamy, strengthening and magical. I’ll let you know how it fares once it falls in my empties bag. Next product is a neat little cream highlighter by Kryolan. It was custom built for Glossybox subscribers and is just the loveliest shade of pinky gold. Or maybe it’s more of a champagne. Doesn’t matter. Point is, it’s very pretty. Has miniscule sparkle – it’s primarily just a glowy, subtle sheen. If you somehow manage to make yourself look a shiny mess with this stuff, you are DOING IT WRONG. It’s pretty much idiot-proof, and I’m so happy to have it. Best thing in the box, hands-down. And even though you all know I don’t like nail polish that much, this shimmery purple shade from the Sparitual Explore Collection is rather pretty. I don’t know about you, but I enjoy a good purple. I’m super into purple lips right now, and purple eyeshadow looks really good with my brown eyes. What this has to do with this purple nail polish is absolutely zero. However, I will say I don’t have a purple this shade, nor have I ever tried the Sparitual brand. So I’m gonna do mani and pedi this weekend and give it a try. Then put it in my junk drawer for the next 11 years. I’ve been using a day cream for the past 2 months that I haven’t really enjoyed. I was forcing myself to use it since it was full-size product and I paid for it. You know, trying to be a responsible adult and all that. Then I received this Eslor Firming Collagen day cream, and thought I’d go ahead and use it even though I wasn’t done with the other. Well, if I was trying to teach myself a lesson, I either failed or succeeded depending on how you look at it. This Eslor stuff feels ahhhh-ma-zing on the face. Like the softest most delicate cream of life. It took me about 2 seconds to toss the other cream in my empties bin. Why suffer needlessly? And even though the full size is $85, I’m kinda sorta considering it anyway. Last product in the box is what I thought would be my most absolute favorite. It’s the Eyeko Skinny Mini liquid liner pen. I have the Eyeko Skinny Brush mascara and I absolutely love it so I had every expectation of loving the eyeliner too. So I tried it a few days ago. Annnnnnd … awful. Like the worst pen I’ve ever tried. It was barely black – more like a pale grey wash on my eyelid. I thought I was doing it wrong for a second, so I’m shaking the pen, wiping the nib, praying to Baby Jesus. But nothing helped. It was hideous. Remember that great mood I was forced to be in earlier? Well let’s just say I knew I wasn’t ready. I’m gonna give it one more chance this weekend before I pass it along to my sister. And because Glossybox was so late last month, I am now behind on my September boxes. That’s just great. I’ve gotta blog in my sleep just to keep up. My life is hard you guys. SO. HARD.